Primmer and patterns, all in one book!!! Full size book 8 1/2" x 11", 75 pages of instructions, pictures and patterns. Traditional size Cutback style (Saddleseat/Park) saddle pattern with tree and assembly instructions. Traditional size Double Bridle pattern and assembly instructions. 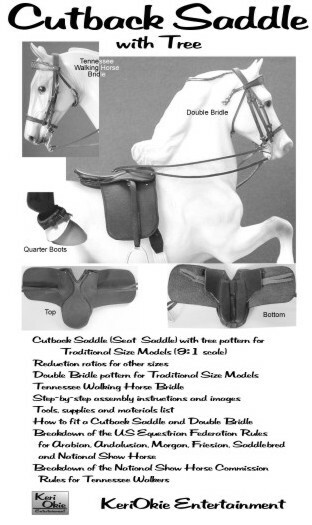 Traditional size Tennessee Walking Horse bridle pattern and assembly instructions. Quarter boots pattern and instructions. How to fit a Cutback Saddle. Breakdown of the US Equestrian Federation rules for: Arabian, Andalusian, Friesian, Morgan, Saddlebred and National Show Horse. Breakdown of the National Show Horse Commission Rules for Tennessee Walkers, performance-shod or flat-shod. Reduction ratios for other model sizes. Tools, supplies and materials to use for best results.